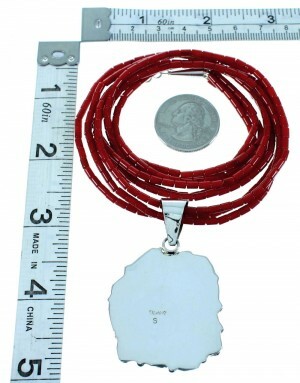 Pendant measures approximately 2-1/4" long and 1-1/2" at it's widest point. Necklace measures approximately 21-1/4" long. 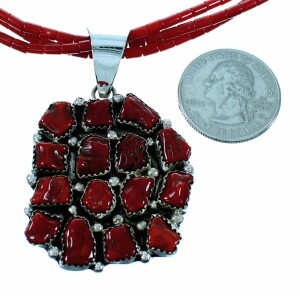 Excellent craftsmanship is shown throughout this amazing necklace! 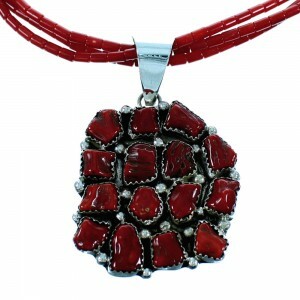 In this Native American jewelry set, the pendant is Navajo hand crafted out of genuine sterling silver and real Corals. A total of FIFTEEN Corals are carefully set in hand cut bezel settings, while being accented by mini silver beads for an adorable look. 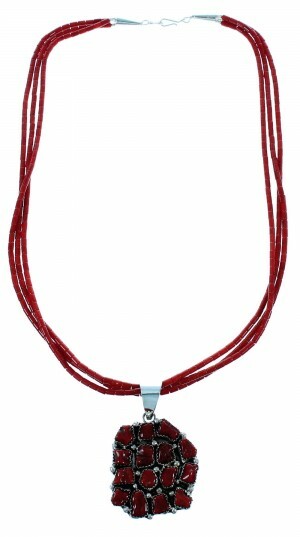 The necklace is made up of THREE strands that consist of: 2-mm silver round beads and 3-mm Coral heishi beads. 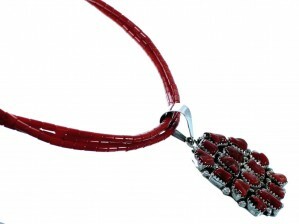 Each end of the necklace is completed with a silver cone for a beautiful finish. The cones are stamped sterling.